It’s Friday, Halloweek Day 5, which means this is the last Halloween look I’ll be posting on my blog this year. But make sure you follow me on Instagram because I’ll continue to post SFX makeup and the likes on there. This last look was requested by a friend, who wanted to see a half skull look. 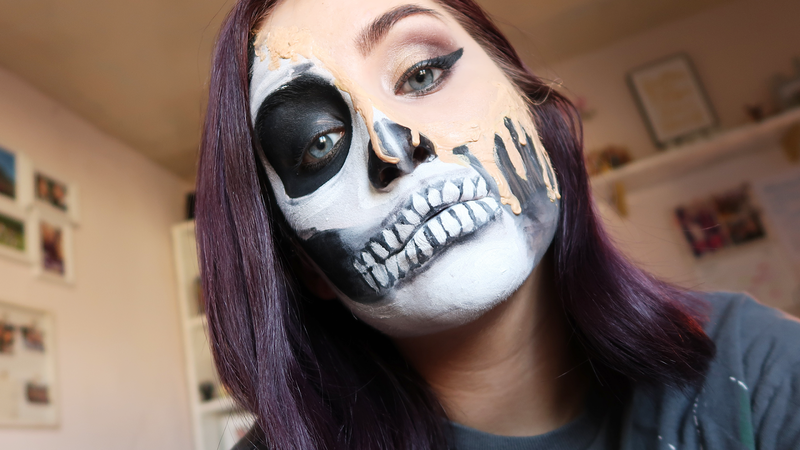 I had seen lots of people do various versions of a half skull, and my favourite by far was by Desi Perkins on YouTube. I started by using a very small amount of white to map out where I wanted the skull to start and end. It was just a very rough guide so I could get started on the “normal” part of my face. For that, I just did my usual makeup and a smoky eye. You, of course, don’t need to wear any makeup at all, or you can play around with different eyeshadow colours and looks. I did my foundation right up to where I drew the guidelines before. For the skull, I started on the cheek below the “normal” eye and went around where all the melted parts will be with black. I mixed in some white to create more grey areas, and to give the illusion of shading. I used the black to make the other eye area look like a skull eye socket, and started on the nose and cheekbone. I made sure I worked hard on shading, using white to create grey the closer the cheekbone got to my mouth. You can use lots of skull reference pictures on Google to play around with how you’d like your shape and style to be. I then used the white face paint all over the rest of my face that was left. I had to do a couple of layers to make sure it was opaque enough. For the teeth, I used a very fine detailer brush to map out the outline with black. I used any leftover paint on the brush to do the shading around the teeth. I went in with the white face paint to define them and make them look whiter than the rest of my face. I applied colourless powder everywhere, to make it matte and likely to last. Then for the fun part, the melting skin! I know Desi used 3D gel to create her drips, but it’s not easily accessible and it’s not particularly cheap. A cheaper alternative, that most SFX lovers already own is using flesh coloured liquid latex. You could also use regular liquid latex, but colour with paints or your foundation. I poured the latex into a small disposable plastic pot and used the opposite end of my brush to apply it. It’s important to not use the bristle part of your brush because it will damage it. I picked up quite a bit of product on the end of my brush, and applied it onto the guideline of my skull, allowing it to drip down on my face (do not allow this to go into your eyes!). Once I felt like the whole guideline was covered by latex, and there were enough drips to look satisfyingly melted, I used a hairdryer to dry the latex quicker. I used a little more of my foundation to cover the line between latex and my skin, so it blended better. Looking back I would have used white latex and coloured it myself, as the flesh colour latex was a little dark for my natural skin tone. I’m super pale so I should have guessed that really! If you recreate this look, I’d love to see your pictures on Instagram, so please tag me and use the hashtag #BecxHalloweek! I hope you enjoyed all my Halloween looks this year, I definitely enjoyed doing them, and I’ve already started thinking about next years looks! Welcome to Day 4 of #BecxHalloweek! 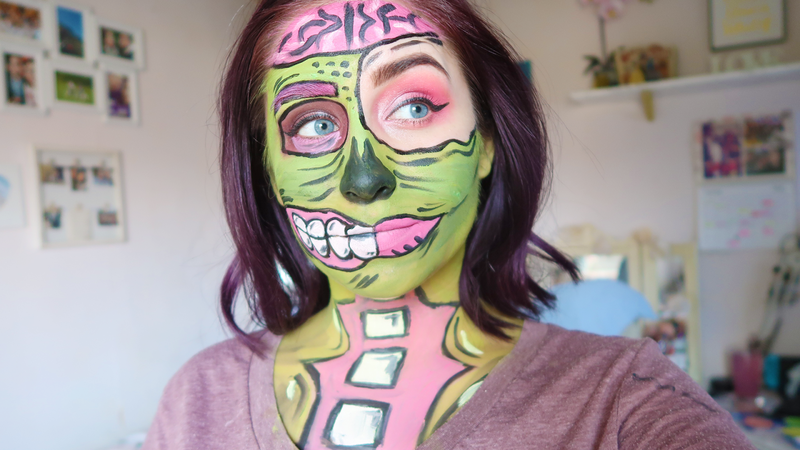 I saw this very cool pop art style zombie on @AideenKate’s Instagram and I knew straight away I wanted to recreate it. 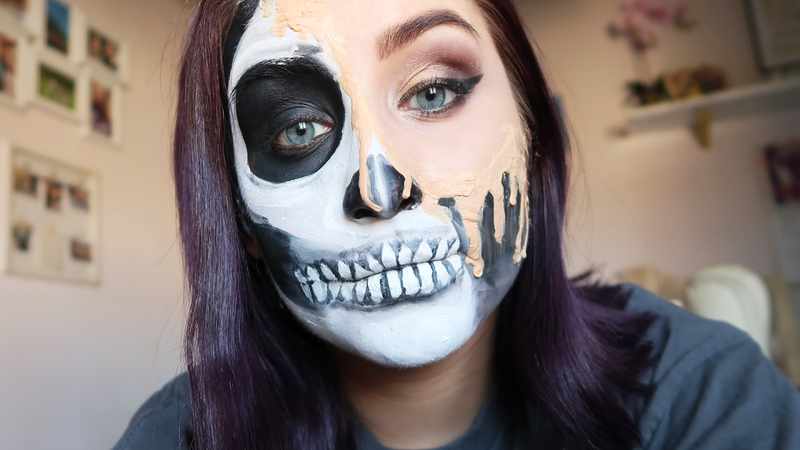 I thought why not use it for one of my Halloweek looks and tell you all how I did it too! The first thing I did was an outline where I wanted everything to be on my face, using the Revolution Renaissance Flick eyeliner. It helped to give a good guideline for what to do next. I mixed the green and yellow face paint together, so it had different tones running through it, which helped my face look like it had a bit more dimension to it. I painted the large parts of my skin that I knew needed to be green. Whilst that was drying, I did the eye which had the largest black circle around it. I did just a regular eye look, with the eyebrow, eyeshadow, liner and mascara. I used pink to match other parts of the face paint that I knew were going to be pink. You can use any kind of colours you want, or you can leave the eye with no makeup if you’d prefer. When the green face paint had dried, I moved onto the pink. I made the brain area, mouth area and neck area pink as if it was all exposed flesh. I tried to make it as opaque as possible, doing 2-3 layers of it. I also did my other eyebrow pink. Whilst the pink paint dried, I used black and pink eyeshadows on the eye that had the smallest black circle around it. I added in some white shimmer for a more glam effect, but you can use any colours you fancy. I think yellows and greens would also look good! When the pinks were dry, I went in with the whites. I used white for the painted-on teeth and the spine area. Again, to make it opaquer, I did 2 or 3 layers. I went back in with my black eyeliner to make sure all the black lines were showing properly, especially if I had accidentally gone over them with paint. I also used the black eyeliner to create “brain” type markings at the top of my head, and any wrinkles or shading. I then used white to “highlight” any areas around the black, that you can see in the brain and down the collarbone areas. Not forgetting the nose, I used black face paint to create a skeleton type nose, which matched the overall look quite well. I love how this look turned out, it looks funky and creepy at the same time. It would be a really good look to do for Halloween if you’re not sure what to be but have some face paints lying around at home from previous years! 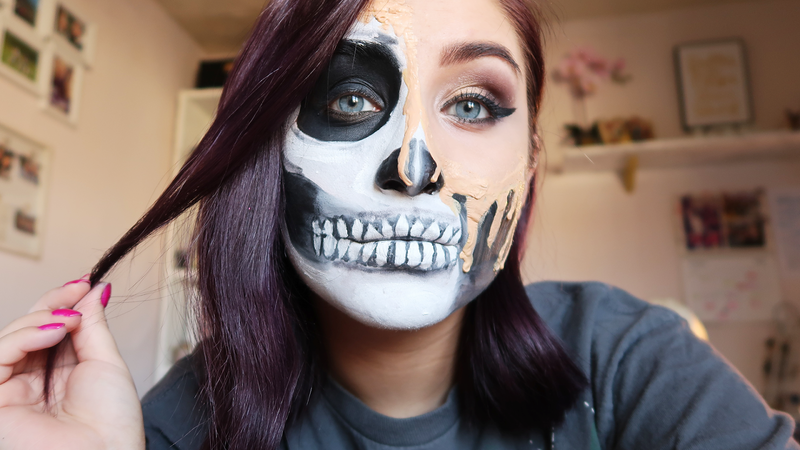 If you recreate this look, don’t forget to use the hashtag #BecxHalloween so I can see them! 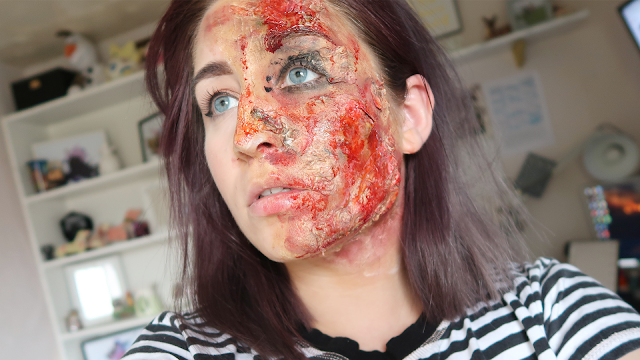 Trigger Warning: graphic content - but it's all fake and just makeup! We’re half way through! For day 3 of #BecxHalloweek, I thought I’d show you this zombie mouth SFX makeup look that is of course, heavily inspired by the one and only Mykie from Glam and Gore. 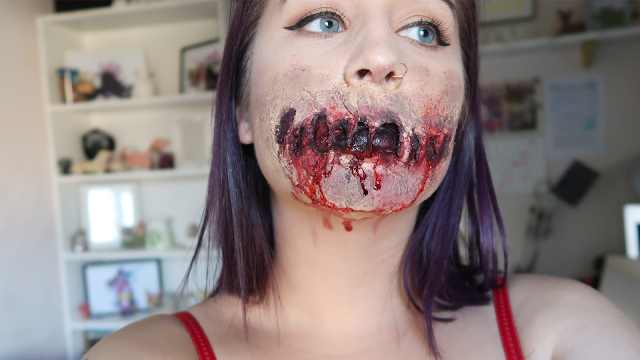 I love this makeup, and it is the perfect gory look for Halloween if you want to have impact. I did my makeup as usual, keeping the lower half of my face below my nose makeup free. You of course, don’t need to do makeup on the rest of your face if you’d prefer not to. I just like to wear makeup! I started by mapping out where my mouth would go using black face paint. This mean the inside of the “zombie mouth” would be black, and it’s easier to do this first rather than going in with paint later on. Then I started applying a thin layer of liquid latex to my upper lip. I applied small amounts of cotton wool, dragging some bits downwards so they were hanging. I put more latex on top and allowed it to dry. I moved outwards to where I would want the corners of the mouth to be and bought it to a tip, much like what a normal mouth would look like. When it was dry I started on the lower half of the mouth, applying liquid latex under my lower lip and on my chin. I added cotton wool the same way as the upper lip, only I dragged some of the wool upwards, connecting it to the zombie mouth at the top. I didn’t let the latex stick to my lips so I could open and close them still. Once my zombie mouth was forming the shape you see in the photos, I did one more layer of latex to make it a bit smoother and blended the edges into my skin a bit more. I used a small metal carving spatula to make any gaps larger and to move any latex out the way, until I was happy with the overall look. Once everything was dry, I brushed translucent powder over my mouth to take away any shine from the liquid latex. I then put on foundation, so it matched my skin tone. I used red face paint in and around the gaps, to make them look bloody and wounded. I used black face paint again on all the holes, so the edges of the fake skin look damaged. I used a brown eyeshadow over the mouth to make it appear more bruised and damaged, with a mix of purple in some parts. Of course, we couldn’t finish without fake blood, so I dripped it where the holes were, as if they were dripping blood down my chin, and used a brush to get some inside them. I sprayed my face carefully with a fake blood spray to create a splattered effect. I absolutely love this makeup look, it’s spooky, gory and it’s almost like a classic now. I know I say this in every post, but if you try this look after reading this blog, do tag me in your photos! 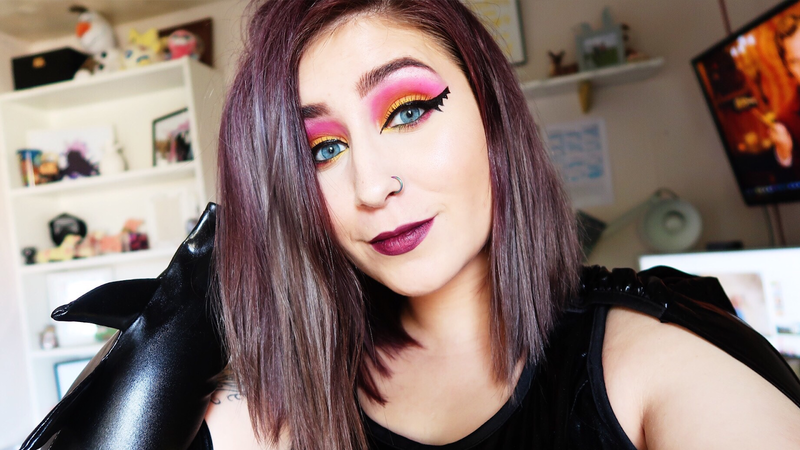 It’s day 2 of #BecxHalloweek and today I thought I’d show you this Batgirl inspired makeup look – that I’m actually going to wear this year for a Halloween party! It’s a simple, but effective look and it's perfect if you don’t fancy wearing the Batgirl mask that comes with most of the costumes. Or even if you fancy wearing themed makeup, without dressing up too much. Do your usual makeup with foundation, concealer, contour and the likes. 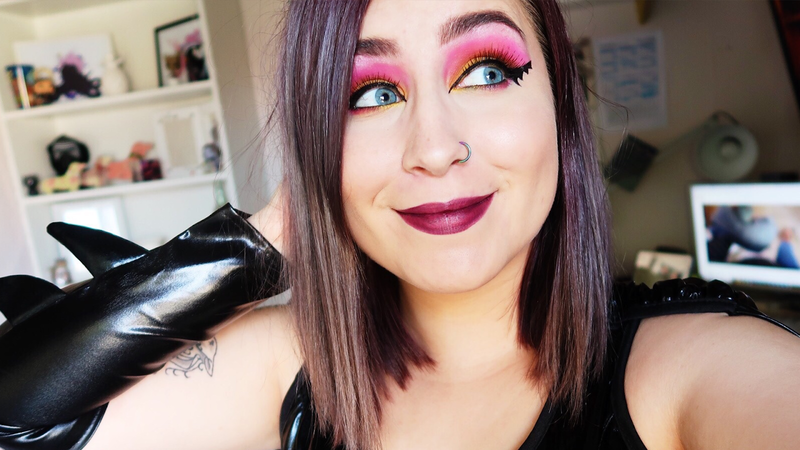 For your eyes, I know the colour in the photos looks quite pink due to the light, but it’s actually a purple from the Sleek Ultra Mattes palette – but you can use any kind of purple as long as it’s bright and matte. I ran this through my whole crease and blended it upwards towards my brow using a small fluffy brush. I wanted it to be quite a statement look so it took up a lot of eye space. 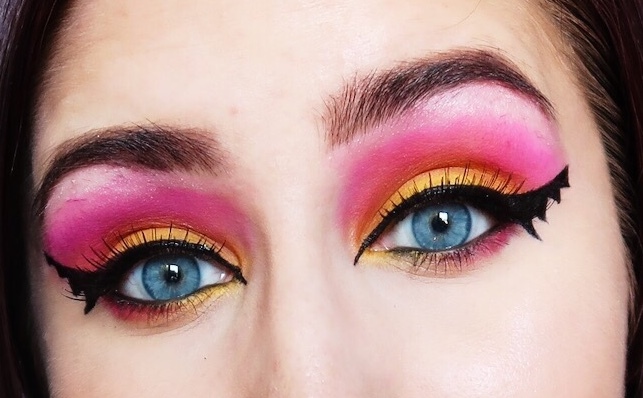 I used a bright yellow eyeshadow from the same Sleek Ultra Mattes palette and put it all over my lid using a flat brush. To make the colour more pigmented I sprayed the shadow on my brush using a fixing spray, so it was damp when applied. I then used a clean fluffy brush to blend the yellow and purple together deep into my crease. For the eyeliner, I used my Revolution Renaissance Flick felt tip liner to create a normal wing. I extended the wing out further than I usually would and made it thicker. I made 4 small triangles under each wing, connected to it, to create a batwing effect. I the same purple eyeshadow as earlier under my waterline, only bringing it ¾ of the way to the inside of my eye. I used the same yellow eyeshadow for under my waterline on the inner corner. I finished with a regular black eyeliner pencil on my waterline. Pop a purple lipstick on, and you're good to go! See! Surprisingly easy to make, but it looks really cool! If you re-create this makeup look, please do tag me in any photos so I can see them! 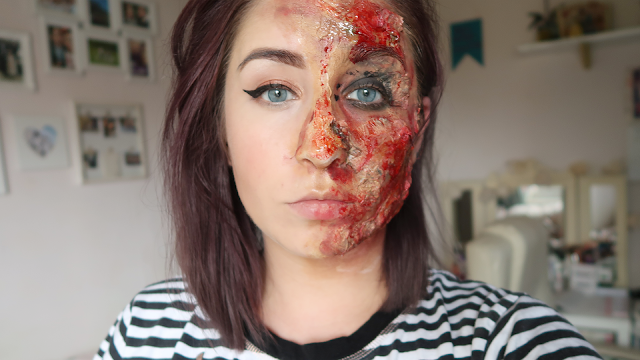 Trigger Warning: graphic content – but it’s all fake and just makeup! Welcome to a new series here on my blog! Halloweek! 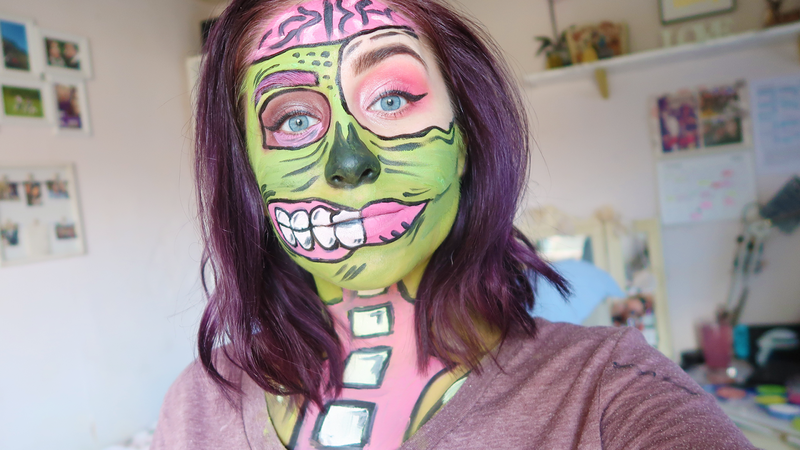 Monday to Friday this week there’ll be a new blog post each day on a Halloween makeup look. Today I’ll explain, as best as I can, how I created this burned face SFX makeup – while I’m no SFX expert by any means at all, I have a rough idea of how to work with liquid latex and paints. I’m sure in a years time, I’ll look back at this with loads of ways to improve it, but I’m pretty happy with how it turned out! I started with half my face makeup done on one side – just my usual foundation, contouring, eyeliner and such. That’s just because I enjoy wearing makeup and I liked the contrast. But you don’t need to have one half of your face with makeup on like this to get the same effect. I also made the eye on the side I wanted to be burnt all black, just using a basic black eyeshadow. On the side I wanted to “burn”, I made sure my skin was nice and clean. I started applying a thin layer of liquid latex to my face, ensuring I didn’t touch my eyebrow. If you want to cover your eyebrow, glue it down with a glue stick and put Vaseline over the top, to prevent the latex from pulling out any hairs. I layered bits of ripped tissue paper on my face quite randomly, with no real pattern. I put more liquid latex on top and repeated this process, making sure each layer was completely dry before continuing - until I felt like my face was of a good, bumpy, uneven texture. I also used fake blood and a blood spray to give the effect of open and fresh wounds, letting some of it drip down my face towards my neck. To finish, I used lubricant, (yep, good old lube), on my burns to make them look moist and even more fresh out the fire. If you replicate this look, I’d love to see them! Tag me on Instagram and use #BecxHalloweek so I can find them! 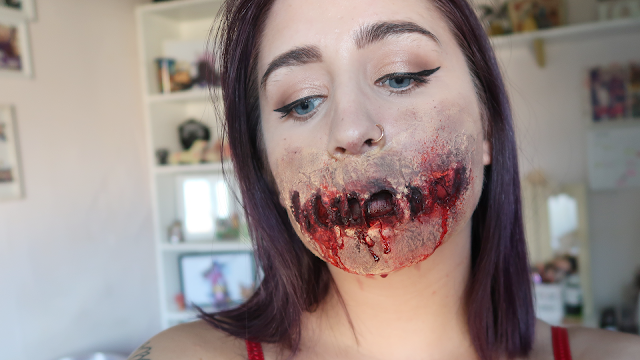 It's such a simple, easy way to get into SFX makeup since most of the products used are so accessible. ** I'm writing this note after this post was written and scheduled. Since posting this, I've realised, thanks to a friend who let me know, that using a disfigurement (such as a burn victim), can come across as offensive. Disfigurements are not costumes. It hadn't occurred to me before that it was insensitive of me to do this look - but rather than removing the post, or pretending like it didn't happen - I thought why not use it to inform others what I've learned. The techniques above can still be used for Halloween costumes like DC's "Two Face" or Harvey Dent. But please be mindful of what you dress as for Halloween. 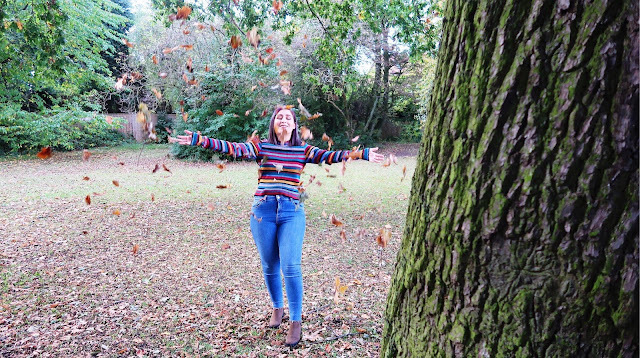 It’s World Mental Health Day and in light of that, I thought it would be the perfect time to talk about my own experiences with mental health. 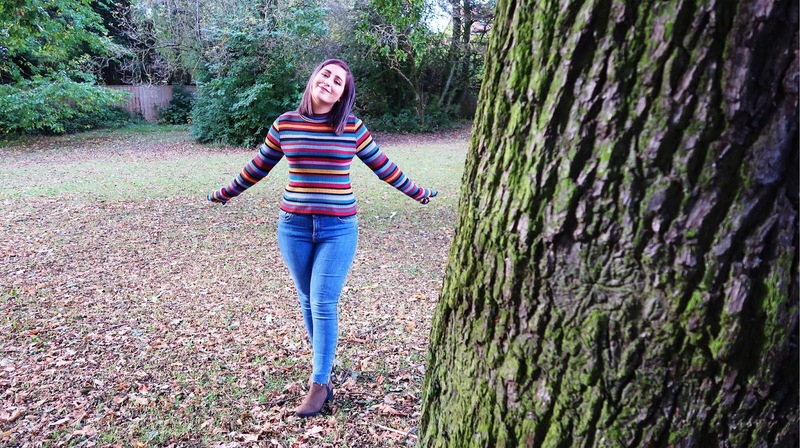 I’ve talked about it briefly in different blog posts before, but I wanted to make this post solely about mental health, and not about physical health too. Mental health is just as important as physical health. I have Generalised Anxiety Disorder and Depression. It’s something I’ve struggled with since I was a teenager, even though at the time I didn’t realise it. Looking back at different periods of my life, I know my depression and anxiety was prevalent throughout, now I’m more aware of the symptoms and how they affect me. I only really started seeking professional help for my mental health when I was 23, not long after I was diagnosed with a physical illness. But I suffered through poor mental health bouts long before that. It saddens me that mental health isn’t taken as seriously as physical health. If you feel physically unwell, you can see a GP usually within a week. If the GP cannot deal with it, they’ll refer you to a hospital or specialist and get seen within a few weeks. If you have poor mental health, most GP’s are not trained in it, and often dismiss it. That was certainly my experience for a while. Until I was eventually seen by a very empathetic GP who was brilliant, gave me antidepressants and referred me for therapy. Now, to see a mental health specialist for therapy or counselling can be hit and miss. It’s an amazing step in the right direction that you can now get talking therapies for free on the NHS. However, the wait times are so long because it’s still very underfunded. The wait time can be 16 weeks, and in my case, it was 6 months before I saw someone. I only had 9 weeks of therapy, which is more than most I know. I felt like I could have gained so much more from a more in-depth course of therapy. As someone who struggles on and off with depression, I may not be depressed in 6 months. I certainly feel like therapy should be available when you need it. There needs to be more funding into mental health provisions, so people get the help they need; when they need it. Mental health is just as important as physical health. Be kind to others, you never know what they might be struggling with. Often depression and anxiety etc, go unseen as it’s easier to say “I’m fine” and show a brave face. More people have poor mental health than you realise. I know I’ve struggled in the past, been on different medications and had talking therapies. I’m back on the referral waiting list right now for therapy for depression - no one is immune to poor mental health. ‪Reach out to family, friends or a professional if you’re struggling, you are not alone. If you notice someone is quieter, not themselves or distanced away from your usual group. Reach out to them. Be a listening ear. Support them.